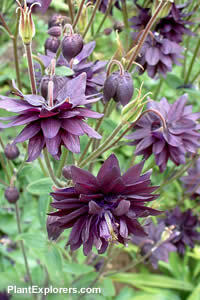 This is a dark purple, almost black, double flowered selection of that delightful, and reliable, old fashioned perennial so many people remember from their childhood. Growing 60-90cm (2-3ft) in height, it will produce double flowers, held well above the foliage on slender stems, in the mid to late spring. For maximum freshness, please keep seed refrigerated in its original packaging until ready to plant. Seed should be sown in containers in spring in a coldframe or other sheltered outdoor location. Grow on in average to fertile garden soil in dappled shade.